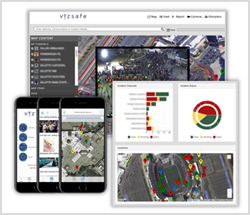 With Vizsafe, we can map and share critical visual information with our partners in public safety and law enforcement to coordinate a response using the Vizsafe platform and the power of crowdsourcing. Gillette Stadium, New England’s premier concert, entertainment and sports event venue, announced today that it has selected Vizsafe’s Geoaware(TM) Services Platform to enhance stadium safety and security. The stadium is home of the National Football League’s five-time Super Bowl champion New England Patriots and Major League Soccer’s five-time Eastern Conference champion New England Revolution, as well as host to numerous international soccer matches and many of the world’s largest concert tours.